Enterprise/Hemdale/Pact/First City - 90/108 min. 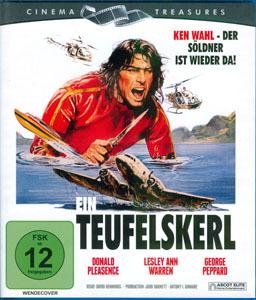 Cast: Ken Wahl, Lesley Ann Warren, Donald Pleasance, Bruno Lawrence, Grant Tilly, George Peppard. Screenplay: Everett de Roche; Photography: Vincent Monton; Editor: John Laing; Composer: Brian May; Producers: Antony Ginnane, John Barnett, David Hemmings; Director: David Hemmings. A deer hunter(Wahl) and his bumbling partner(Pleasance) by chance stumble upon the wreckage of a DC-3 on the shore of Lake Wakatipu. Included amongst its cargo are medals, booze, money and $50 million in gold bullion. Before they can begin recovery, others get wind of the discovery and show up to pressure them in revealing the location. This is an action/chase, frankly silly, film with most of its energy occuring in the numerous stunts, chases and explosions. Great helicopter shots of Fiordland and the Queenstown area. New Zealand's first big budget ($6 million) co-production. R4 PAL DVDs are available from Australian or NZ sources for about $15. The DVD has no extras, but it is presented in the original 2.35:1 Cinemascope widescreen. The box slick says that the screen format is 4 x 3 Full Frame, which it clearly is not. There is a short "historic" footage at the beginning that is in 1.33:1 format, but after that the format changes to 2.35:1 for the rest of the movie. 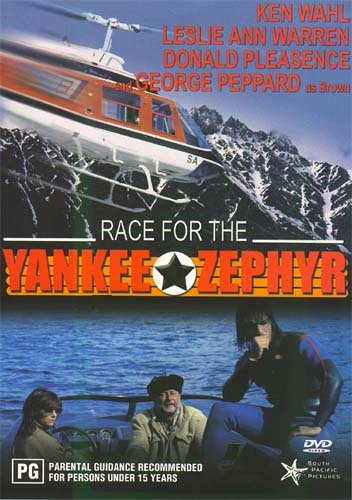 An R1 version was available, under the aka of 'Treasure of the Yankee Zephyr', but as of June 2009 is OOP. There is a double feature R1 offering by "East West DVD" that is a low cost, low quality ripoff that is not recommended. Older vhs versions are not in the original cinemascope widescreen format. A Blu-ray version is available for the equiv. of 12eur. It originates from Ascot Elite in Germany. It is coded region B. It is presented 1080p 2.35:1 with both spoken English and German DTS-HD Master 2.0 audio tracks. There are no subtitles. At the same time a PAL R2 DVD re-issue was released by Ascot Elite, 2.35:1 anamorphic with German DTS and English DD2 audio. There are some trailers on both DVD and Blu-ray. North American Blu-ray and DVD versions was released from Kino Lorber starting 04 December 2018. The Blu-ray specifications are the same as the Ascot one from Germany, except that the unrelated trailers are different and that the German BD is a BD-50, whereas the Kino Lorber BD is a BD-25. Therefore, as you might expect, the bitrates are different. The Germany BD bitrate average is 35 Mbps and the US BD bitrate average is 22.4 Mbps. If you are able to play Region B discs, the Ascot Elite BD would be your better choice. I should also mention that the Ascot Elite disc is 110min., whereas the Kino Lorber one is 90min. 1982 - Knokkeheist Film Festival - Best Actor: Donald Pleasence.